If you were asked what plant someone should stay away from in the great outdoors, your first thought is likely to be poison ivy. While that is a very good answer, I’d like to introduce a couple of others that can cause quite a bit of pain if you happen to brush up against them. The two plants that I would like to introduce you to are commonly know as stinging nettle and Texas bull nettle. According to a quick check online, stinging nettle can be found throughout much of the world whereas TX bull nettle may be limited to the southern central US and Mexico. Stinging nettle can be an inconspicuous plant growing among pasture grasses or in other areas as seen in the first photo. This plant has tiny stinging hairs that will cause a painful site reaction when touched. The pain often subsides in a few minutes, however I have known it to cause welts and prolonged pain/discomfort in some individuals. Often, when I have not managed to avoid it and am experiencing its painful sting, I have had to look closely for the offending plant because it can blend in so well. Strangely enough, the young leaves are supposed to be able to be prepared properly and eaten. I’m not planning on giving that or puffer fish a try though. 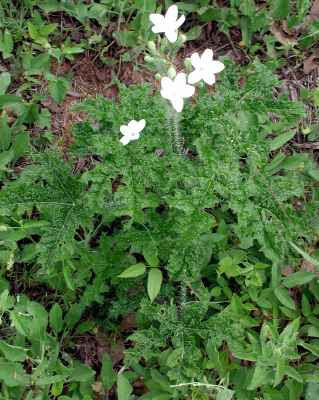 A much larger and more noticeable plant with pretty white flowers in the spring is Texas bull nettle. As you can see in the second photo, this plant is a bit easier to see and therefore to avoid. I had the good fortune to find out about this plant before touching it, as its sting is reported to cause more pain and for a much greater length of time than stinging nettle. Stinging nettle is bad enough for me. I have no curiosity about just how bad bull nettle’s sting is. Before you go on an eradication spree however, you need to know that these plants are host plants for some butterflies so they are an important part of the ecosystem. Also, don’t forgo enjoying the great outdoors for fear of brushing up against them. Wearing long pants and tall socks while hiking around and watching where you put your hands should keep you pain free. 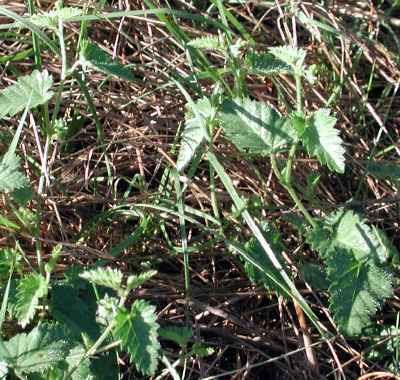 Hopefully the information in this article will allow you to identify and avoid these two plants and thus keep you from finding out why the plants are referred to as “stinging” nettles. 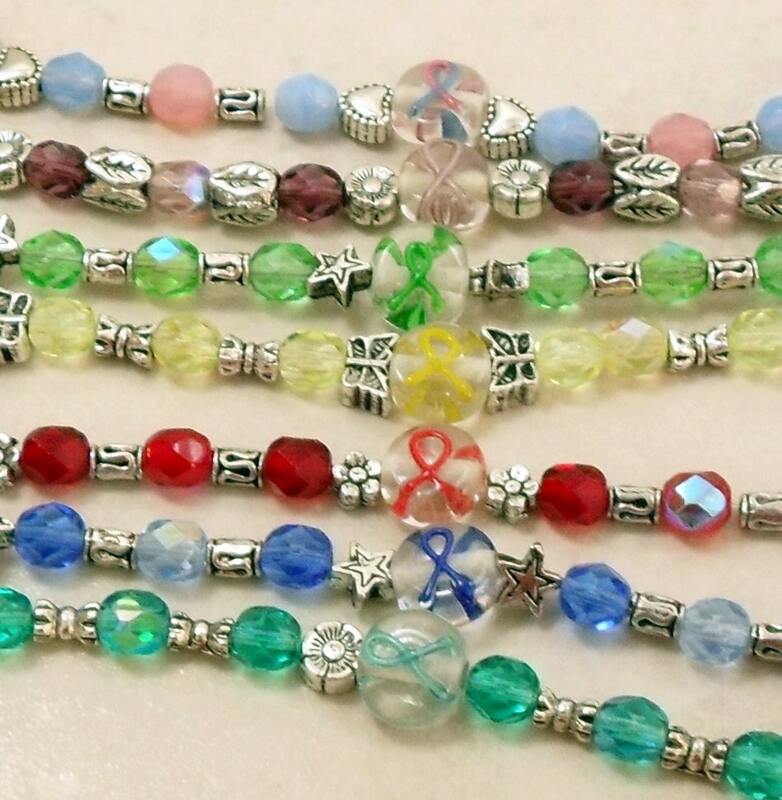 Ever since I did a custom bracelet order for a customer last summer using colored crystals to represent the birthstones of the people to be represented in the bracelets, I have pondered jewelry designs that could easily be customized for customers with the birthstone colors of their choice. After much thought and research, I have come up with designs, using materials that I am confident that I can replenish as needed, for custom birthstone necklaces and earrings. For the necklaces, I envision representing mom and dad with inline crystal sections. The child(ren) are represented in a pendant crystal section. This can be added to as a family grows. Of course, anyone dear to you can be represented in any of the crystal sections. I am currently offering two basic necklaces at a couple of different lengths and price points. Custom lengths are also available. The first photo shows a 17 ½ inch necklace made with silvertone figaro chain and findings. It has two inline crystal sections and a central pendant crystal section. 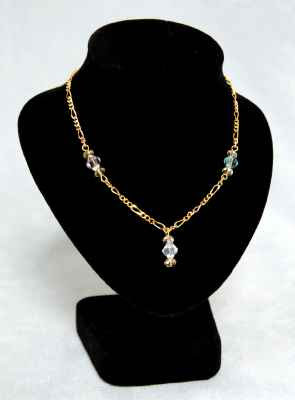 The second photo shows a 16 inch necklace using the same layout of crystal sections, however with your choice of gold plated (as shown in the second photo), or silver plated figaro style chain and findings. Custom birthstone crystal earrings are also available. 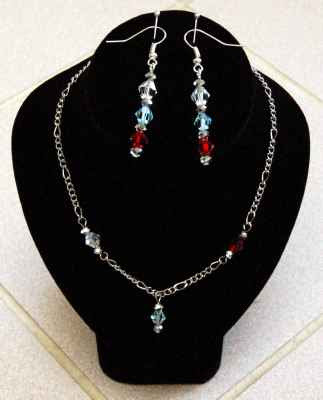 The base style uses three birthstone colors of your choice as shown in the first photo. They are made with gold plated or silver plated ear wires and findings. Custom birthstone jewelry is a great way to keep your loved ones close at all times. It also makes a great gift for a new mom, grandmother, etc. Who you choose to represent is up to you. 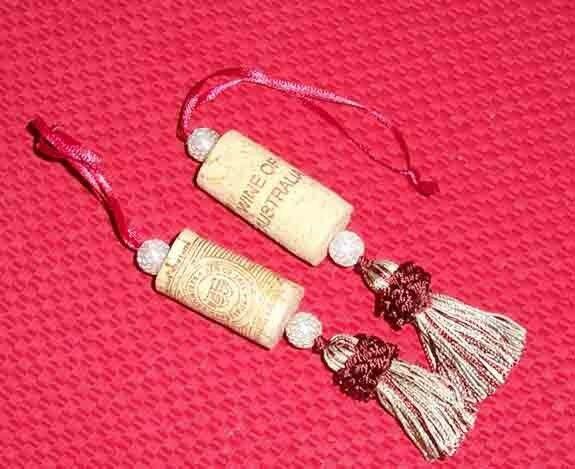 Let me know the months that you want represented and in which crystal sections on a necklace or in what order for earrings. My contact information can be found at EclecticDesignChoices.com. The perfect accessories for a costume are like the icing on a cake. They should complement the costume while supporting the theme and not detract from it. Whether your costume is for a play, Halloween, a party, a convention or other fun event, I’m always happy to brainstorm a solution to your needs. A general Etsy alchemy request for “Earrings To Match Harlequin Jester Costume” caught my eye. There was a sketch of the costume and it suggested to me some materials that I had on hand. The request also included a need for hypoallergenic ear wires. I stock a variety of colors of niobium ear wires for people with sensitive ears so I was off to my supply room to put together a mock up for the request. The person that placed the request liked the basic design but wondered if I could add some of the blue accent color in the sketch. I had just picked up some awesome blue sponge coral beads that seemed to be the perfect color and had some that were small rounded cubes that I suggested adding as a dangle from my original design. I also suggested a dark blue pair of niobium ear wires as an option. (photo #2) After looking at a photo of my other available blue sponge coral beads, my customer decided to go with the dangling cubes and the dark blue ear wires that I had suggested. 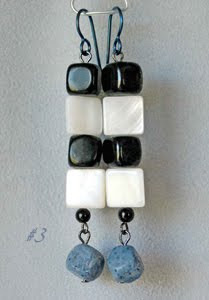 All that was left now was to make up the earrings (photo #3) and get them shipped to my customer. 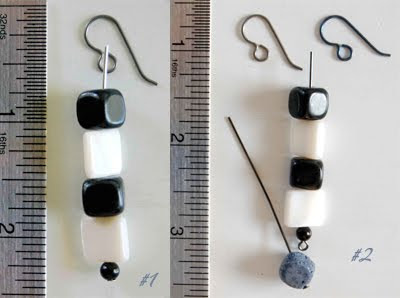 I think the shapes and colors of the materials of the earrings will be a good fit for the design of the costume and the niobium ear wires will both add a bit of color and provide a hypoallergenic solution for comfortable wearing for sensitive ears. If you would like for me to brainstorm a solution to your accessory needs, please click on the “request custom item” or “contact EDCCollective” button in my shop. I really appreciate being featured by the treasury makers. To thank them, I have listed below (in alphabetical order) links to the 7 different shops that featured at least one of my items, as well as an item from their shop that I like. 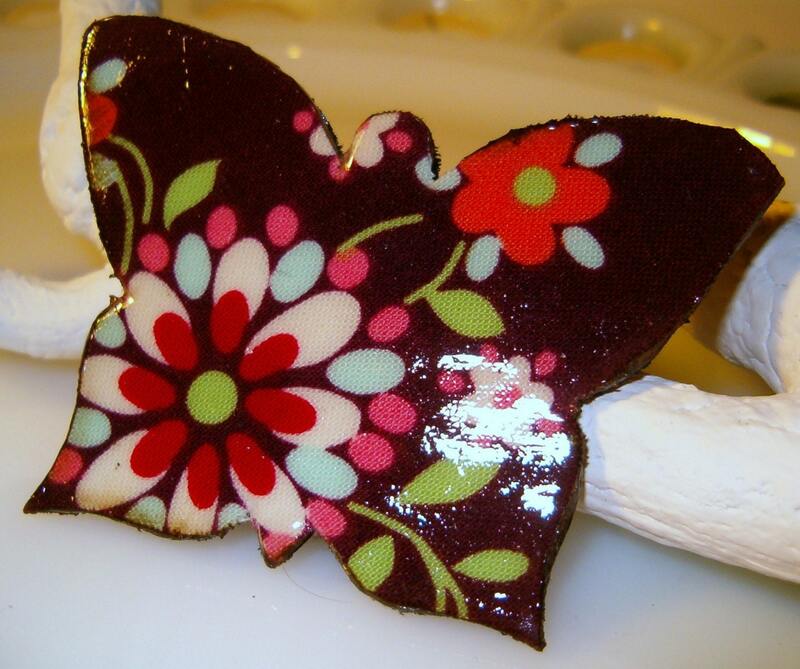 BellaVioletta's upcylced art includes pins like this beautiful butterfly brooch, journals, stickers and other embellishments. 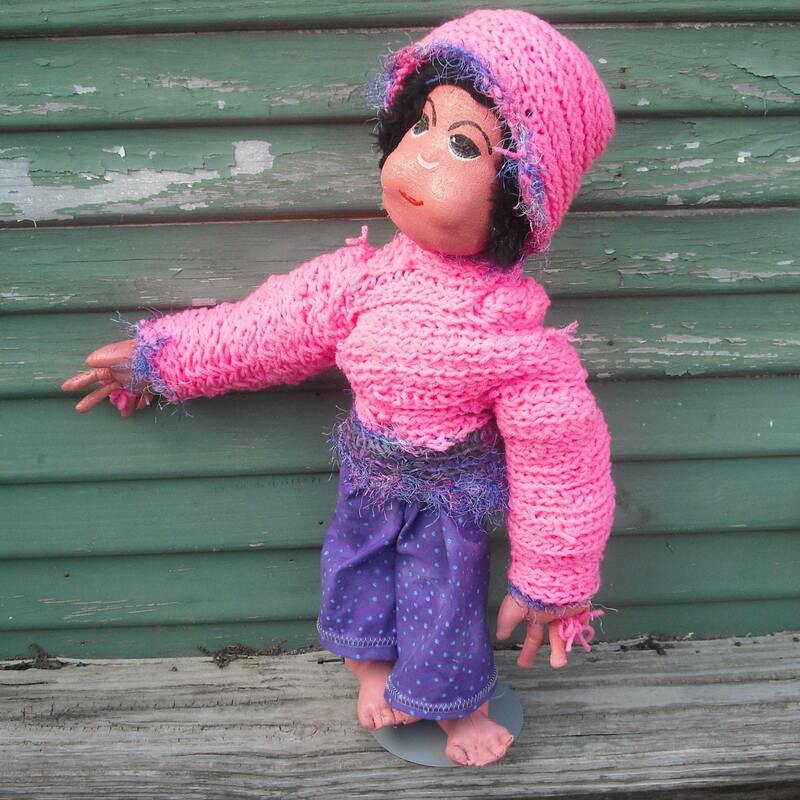 This talented crafter has a wide range of items to offer you, from art dolls and stethoscope covers to custom graphics. Cheryl works diligently to raise awareness for a wide range of great causes. 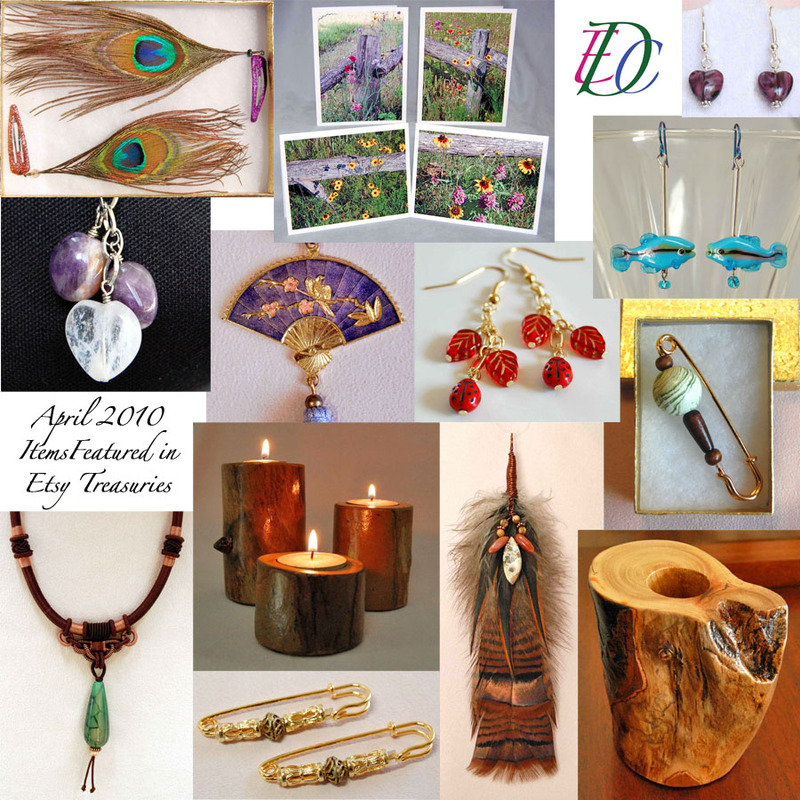 You will find a variety of awareness and other jewelry in her shop. 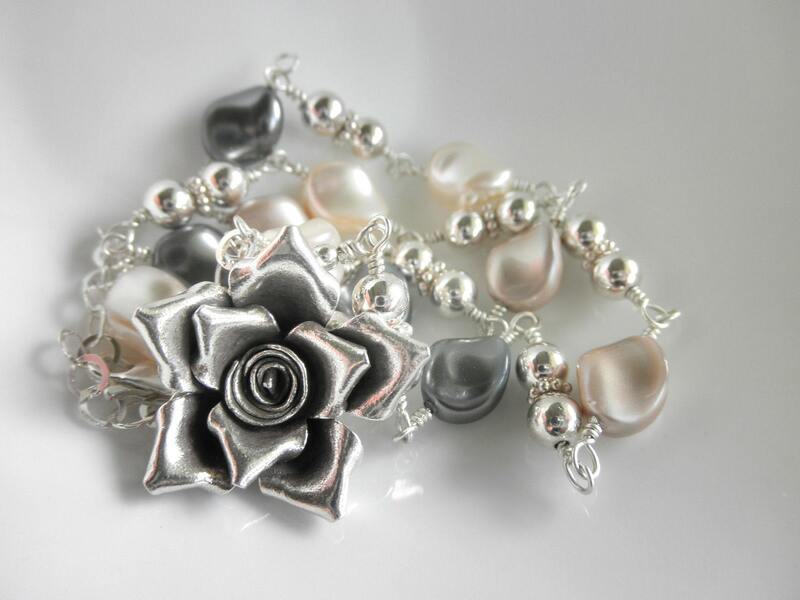 Exclusive handmade jewelry designs such as this stunning necklace are presented by GaBeadz. 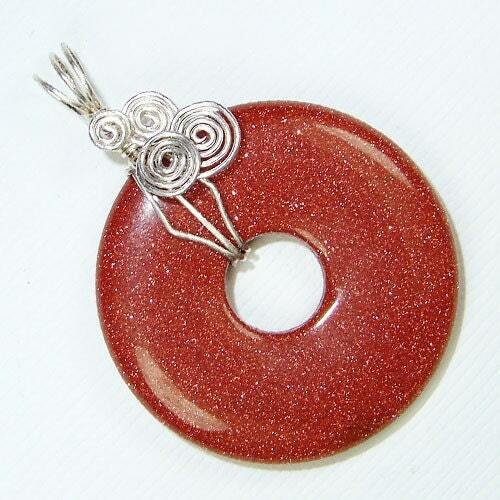 Fine handmade jewelry and accessories for all occasions such as this lovely wire wrapped goldstone pendant. 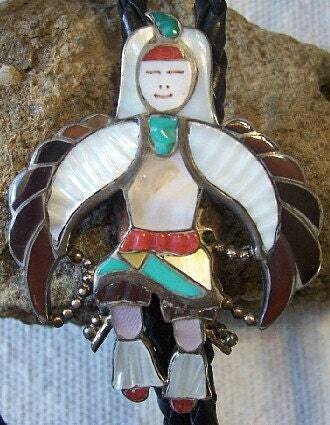 Shop for OOAK and vintage sterling silver jewelry and gifts such as this amazing inlay bolo tie.